Paradise is the term for a place of timeless harmony and is often associated with the Garden of Eden. 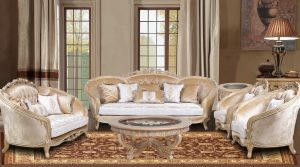 Eden’s Paradise exudes Old World European styling and is beautifully crafted in Poplar solids and Cherry veneers showing exquisite details with dramatic carvings throughout the collection. Marble accents, beveled glass, and custom hardware add to the beauty and charm of this collection. Finished in a gorgeous Ginger with slight antiquing and distressing, Eden’s Paradise brings warmth and comfort home with its relaxed elegance. French and English dovetail construction on all drawers along with self‐closing under‐mount glides. Beautiful “V” cut accents sparkle on the china door glass. Signature velvet‐lined removable silverware tray in sideboard and buffet. China has LED lights with 3‐way lighting.